A Today’s Special x 5. Before I talk about the upcoming Today’s Special, I wanted to thank everyone for their supportive comments when someone had suggested that the reason we changed our policy to give away Free Shipping was because we were having business problems, which they felt were a result of me making political comments. First of all, I do my very best to avoid making political comments, since I respect everyone’s point of view and mine is just my own and no more valuable or correct than anyone else’s. The only thing I was trying to point out is that given my focus on our health and wellbeing, it just seems as though the news and political dialogue are attacking our peace of mind and sensibilities and therefore our health. As I have said, we can all disagree about our political opinions, but there is no reason why it cannot be done in a fashion that respects ourselves and those with whom we might disagree. Compassionate, respectful dialogue is the way toward all progress and I prefer it as the appropriate way to resolve all issues in my personal and business life and I see no reason why it should not apply to the political arena as well. As far as why we introduced Free Shipping, it is not because we are having struggles, but just the opposite. In fact, it was as a result of both our continued growth and a few years of my patient encouragement that HSN agreed to join us in offering you Free Shipping (a nice example of compassionate and respectful dialogue). It was an extremely costly decision for HSN, but as a service to you, they ultimately and enthusiastically agreed. I am very grateful they agreed, since it is in the best interest of those of you who are most loyal to our products. I also think it is basically just more fair, since I realize that, unlike other products on TV, most folks buy their vitamins in stores where there are no shipping charges, so again, I thought it only fair that HSN and I recognize that and offer you free shipping. Moreover, as I pointed out last week on television about our CoQ10, all the efficiencies that result in our expanded manufacturing environment have also resulted in price reductions to you. For instance, CoQ10 used to be more than 10x more expensive 15 years ago than it is today and even our Healthy Hair Skin and Nails effectively costs far less today than 15 years ago, since although the price might be slightly higher, it now contains 8x more of its most expensive and important ingredient – Biotin. The same goes for our Circulation and Vein Support and even for our Essential-1 multivitamin. Last week in our Factory Remote, I showed the new equipment that allows us to greatly increase our efficiencies and thus continue to improve our quality, our service to you and just as important, your savings. Again, I truly do appreciate everyone coming to our defense last week when someone posted a less than warm-hearted comment. ChocoNuvo. We will only have very limited availability of our ChocoNuvo in all 3 intensities: 66%, 74% and 91%. Following a very hot summer, we will now be back in stock for the next several months with our uniquely delicious and heart healthy chocolate. Because we are only now restocking our ChocoNuvo, the supply will be limited and the presentations will be brief. As I mentioned before, it will be presented more fully around the holidays, but I just wanted to make sure that following its unavailability over the summer, we will at least be able to restock your cupboards at Today’s Special pricing. One of the most exciting aspects of the return of this product will be my opportunity to share the incredible reviews we have received, including hundreds that discuss not just its remarkable flavor and texture, but also its powerful cholesterol-lowering results. It hasn’t even been a year since we introduced our dark chocolate, so the almost 1,000 5-Star Reviews are truly inspiring and a bit surprising, since most Americans supposedly prefer less healthy milk chocolate and not rich Dark Chocolate like ChocoNuvo, but ours is truly unique. Again, these will be brief presentations, since we are only now back in stock on this formula. Cinnamon 350. I had heard requests for years (actually decades) to create a natural product that supported and helped maintain healthy blood sugar and insulin metabolism. Of course, the nutrients in a multivitamin are the foundation to achieving these goals, but with the most recent research on cinnamon bark extract, we now have a simple and safe tool to support our blood sugar goals and efforts. Its almost perfect reviews attest to the fact that it is highly effective. Cranberry Benefits. 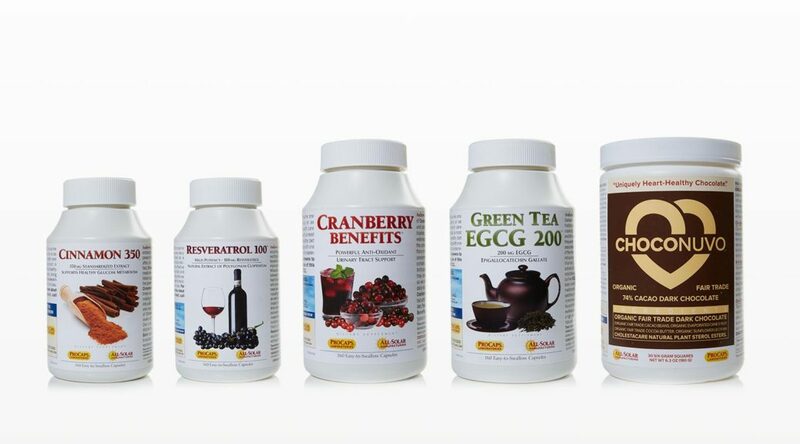 Few, if any, natural products possess the extensive and credible medical research that Cranberry offers for bladder and urinary tract health. It is a consistently recommended ingredient by urologists and supports the body’s ability to maintain a healthy environment in the bladder and urinary tract. Challenges that affect our bladder and urinary tract are a fact of life, and these nagging issues can often compromise the quality of our lives. In short, there is no better researched nor more reliable natural method of promoting the health of the bladder and urinary tract than Cranberry. Resveratrol 100. For almost two decades, Resveratrol has been at the leading edge of natural anti-aging strategies. As a key component in Red Wine, it is one of the central ingredients of the healthy Mediterranean diet and, as exciting as the research on Resveratrol was 20 years ago, it has only consistently evolved and expanded over the last several years. We were among the first to recognize Resveratrol’s remarkable benefits and we have included it in our products for almost 20 years. For over a decade, it has been among our most popular Today’s Specials; however, it has been over 2 years since its last Today’s Special and this weekend it will return with a flourish, since it will be offered at, by far, its best pricing ever. Green Tea EGCG 200. No discussion of the anti-aging benefits of Resveratrol would be complete without mentioning its Asian counterpart from Green Tea, EGCG (Epigallocatechin Gallate). There are few dietary behaviors with more consistently positive attributes for our health and longevity than the consumption of Green Tea. Unfortunately, most Americans have not learned to enjoy or adopt this healthy lifestyle habit and therefore, in lieu of a few cups of Green Tea daily, a Green Tea EGCG supplement becomes an invaluable alternative. Although Resveratrol might be more of a media darling, I view Green Tea EGCG as every bit as beneficial and powerful. The last four products are all at their best pricing ever, and if you choose any four bottles of 360 counts, the pricing becomes even better. Of course, everything also comes with Free Shipping and Handling. Again, I hope that my dividing the Today’s Special up into 5 separate presentations will not complicate things, but my goal was to achieve your maximum savings by providing 5 opportunities to order 5 of our most popular products at Today’s Special pricing. We will endeavor to spend approximately 10 minutes on each product during each hour. Also, we will be doing a special Monday Night show with Adam to celebrate our 20th Anniversary which will feature all of your favorite products, but more importantly, focus on your questions. We are setting up a special email address for your questions and I will do my best to answer as many as possible on Monday night. That address is AskAndrew@HSN.com. We are also going to try and discuss some of the history, evolution and background of your favorite products and how we actually go about making them for you. I look forward to seeing you this Saturday night at 11 PM Eastern Time and then for the Today’s Special at midnight. We then return on Sunday at noon and 8 PM. Also, we will again do a brief sneak peek at the Today’s Special a bit earlier on Saturday evening. Thanks and I look forward to your feedback and questions. Take care and best of health. Previous PostNew Free Shipping Policy! Today’s Special in October!Next PostHealthy New Year! 79 thoughts on “A Today’s Special x 5. Where is the price of the special offer of 5 products? I can’t find it in the page. Please let me know. Hi Annette, click in the box above that is labeled PREVIOUS POST. Really should have been more than 3 flexpays if you buy all 4 bottels.I wanted all 4 but not for over $60 on a flexpay. Was dissappointed and I only bought 2 bottles and flexpay was over $39 not cool!!!! You are fabulous Andrew!!! You were never politically incorrect and always respectful. I take 4 or 5 of your products and I am writing a book about my diabetes which I keep controlled with diet, exercise, and only your products. I am recommending your products throughout my book. You are correct about the highly disturbing political atmosphere. I can not imagine (or maybe I can) anyone suggesting that being reasonable in our political discourse is a bad thing. I have never heard you say anything that would cause someone to be offended. I have an entire kitchen cabinet filled with your things–I hope to get my CO Q 10 with vitamin D soon and I look forward to your visit this weekend. Even if I do not need to order, I watch your shows which are so educational. I appreciate your quality products . Andrew – our family can never be critical of your sage and knowledgeable advice over the years. Any Political genre has never been part of your conscientious and dedicated work in helping thousands to become healthier and in many circumstances regain health and assistance with generosity and furnishing supplements to those in need in today’s world and distributed with love, and improving lives that are far less fortunate , Your many products over the years have been a strong influence, comfort and support and essential way of life to my family through many illnesses, including neurological disorders, effects of chemotherapy, vitamin deficiencies from youngsters to my late dear husband who could not even walk without your circulation and vein support ,omega – 3 vitamin D3, Tumerick and ginger root, Chplestracare , CoQ 10to name a few. and the wonderful ChocoNovo!Your continued research, improvement and development in your expansive, state – of – the – art solar powered facility and quality control has so enhanced and improved the lives of millions. We thank you and look forward to a long lasting and ongoing healthy relationship. We thank you. is there any truth in the claim the enzyme catalase prevents and even reduces grey hair? What is the calorie content of the chocolate and what is the difference in taste of the different intensities. I use many of your products and love them. Am I correct in thinking these 5 products are going to sold together, and I have to purchase these 5 as a daily special? Or are you saying each of these will be a daily special, one at a time? I use many of your products exclusively. They are the only vitamins that I can feel a positive difference. Love, Love all of your vitamins. Thank you for educating us on our health benefits regarding vitamins. Hi Andrew. Do you know anything about the use of some of your products in treating Multiple Myeloma? I have heard of patients using reservatrol, and the green tea extract along with the traditional treatments. My mother had a similar blood disease (polycythemia vera) and her blood improved dramatically when I gave her organic acai powder. The doctor was astounded since the previous month he told her she was nearing the end stage. My mom lived several years longer than expected. I bought the acai by the pound on Amazon. You could certainly try Andrew’s acai as everything he makes is excellent. I would love to know ,too. My best friend, in California, has this,too. I would love to help him. Andrew , I know your business is growing . Many people really find it hard to digest that any business person does things out of goodness of their heart . It is sad but true , most relate all businesses with greed . I am really looking forward to this weekend and know you will give us the best prices possible . Is it necessary to purchase all 5 of the “specials” ? I don’t get HSN on my antenna- tv. Also do you have to order through HSN or can I call directly to Procap Labs? I buy directly from ProCapsLabs all the time. He needs to improve answering legitimate questions presented to him on his site, Facebook, and or HSN. Andrew seems like a nice, caring person, but if anyone dares to ask him fact based questions that may have a science based negative information on any of his supplements he ignores you. Andrew goes well above any other supplement company to summarize the current state of knowledge when offering products. I think you expect him to tell you what nobody else can or will for any one of a myriad of scientific, medical, educational, legal or business reasons. I totally agree with you Bill! Andrew talks Vegetarian like in Digest Assure then uses Bovine capsules and gives extremely poor excuses for not using Vegan capsules like so many other Vegan manufactures use! I find this completing disheartening and look for substitutes in other brands that are pure and free of any type of animal products……..slowly getting away from cheap Bovine/gelatin capsules…. Love Choconuvo– got it this summer (didn’t melt) and just ran out! how about a spicy version? dark chocolate with cinnamon and chilies healthy triple play! Looking forward to your next appearance on HSN. PS: Just an idle thought–what if I added chopped ChocoNuvo to Muriel’s oatmeal cookie recipe… Is it possible to have a negative cholesterol count? I have purchased vitamins from Andrew Lessman for several years with great results for myself and family. My trust for the quality of the products is worth the price with or without free shipping because I know I am getting the best there is to offer from this manufacturer. Today Special prices are a bonus for me and a chance to stock for the year. Please keep doing what you do by making great products, giving us great prices, and educating us with the science. I happen to be watching and agree with what you said about how media can affect us! Love your products and love you!!! I only take issue with the delivery. It take so long for the vitamins to come. Thanks Andrew for all you do for us an your company. Love your products. Except for the woman’s multi. I use to take it until u added vitamin D . Wish that wasn’t in it, Vitamin D seems to constipate me an I have other people that had the same problem . Could this D vitamin have this as a side effect? Looking forward to seeing u this weekend on HSN. Andrew, I am NOT one of those people that thinks the “free shipping” has anything to do with you diplomatically and elegantly commenting the stress of the current political environment . Stress hurts the body and we need to do all we can reasonably to de-stress. In fact, I wish you would say more about the political situations as I view you as a fair and successful business man and an environmentalist. I agree. I watch every one of Andrews shows b/c not only do I purchase the products ,but I love the educational information I learn from him. In fact, I DVR his shows & will sometimes go back & watch parts of them when time allows. I didn’t hear Andrew say ANYTHING about this election or politics & if he did it sure wasn’t in a negative way b/c like I said, I DON’T remember him saying anything wrong about anything or even mention politics! I HAVE never heard him say ANYTHING WRONG!!! I’ve never been so embarrassed about the current state affairs of this country. And I’m also ashamed right now that a very intelligent man who treats his customers with the utmost respect is even being accused by someone of this. There always has to be someone in a group that has to upset the apple cart for everyone else. And who knows, it could be a competitor. I wouldn’t put anything past anybody these days!! Thank you, Andrew for all that you do for your customers. I’ve learned so much from your knowledge about the human body & vitamins. And I’m a Nurse Practioner. I could listen to you all day. This is an honest question. Have you ever thought about doing a CE class for Nurses? You don’t have to do those in person only. You can do them in a variety of ways. Computers, audiobooks, etc. Just a thought. I would love to take one of my CE credits on something you could tie into Vitamins & Minerals. Again, thank you for everything. We’ve become serious fans of your products, Andrew. Our doctor (chiropractor) is astounded at the benefits my husband has achieved with Maximum Joint Effort and Marine Collagen Peptides. He’s gone from an orthopedic doctor telling him his only option is hip replacement or a drug with the typical nasty side effects to serious improvement in mobility and pain. surgery–off the table indefinitely. From multiple problems a day to once or twice a month, maybe. We’ve added many of your products to our repertoire. I am so grateful for that late night over a year ago when I couldn’t sleep and began channel-surfing to kill time. And there you were. Thank you SOOO much!! Andrew your products are the best! I never thought that I would be taking so many vitamins but they work. I feel better today than I have for decades. Thank you for the free shipping please don’t stop. Thanks for always keeping us well informed. You Rock Andrew Lessman!!! If I were rich I would buy every product you make! I have been a customer since watching your first show on HSN and have never been disappointed . Your products cannot be beat. Much appreciation to you for being someone who is held in high regard. I am a regular customer. On October 2nd, I ordered CoQ10 from HSN during your weekend special. I knew we would run out by October 10th, but I falsely assumed that I would receive the order by the 9th. Today, the 12th, I got an email saying I’d receive it within 10 days because it was out of stock. I cancelled the order!!! It has been fairly customary that my orders arrive later than the 3 – 7 days projected. I have put up with this. However, even though you boast that you are a great businessman, this tells a different story. I am angry and fed up with the way your company handles things. I will have to seriously consider whether or not I will ever order from you again. I am a cancer patient who has acquired a multuplicity of health issues with my battle. I am thankful for your knowledge in and the quality of nutritional care you continuously provide. And, I applaud your undertaking and conscientious perspective! As a forever customer with many items on auto ship, I was happy to hear of the free shipping. My happiness was short-lived. I found out that the cost of all of my auto-ship items is increasing. I appreciate your products having spent thousands of dollars on them over the years. I would have been far better off financially to have continued to pay the $8.95 shipping and had my cost remain the same. We will probably have to reduce our intake to less than the recommended dosages so we can afford to continue to take them or cancel some of them. the same with me. Auto ship lost its 10% discount, and prices were up. Now it costs me more. Really no savings with the new program for my auto purchases. Will continue to enjoy the products, but would appreciate a complete explanation on why free shipping for everything included a price spike for me! My husband and I have been taking Andrew’s multi-vitamin, COQ10, Cholestecare, Hair,Skin,Nails, Omega-3, Fibermucil and now Marine Collagen Peptides. We are both 58 and are on no prescription medications. My doctor is amazed at my cholesterol levels. Before taking the supplenents my cholesterol was high. Love, love love all of Andrew’s products! and can’t imagine my life without them! People take me for 20 years younger than I am and I contribute it to vitamins, healthy eating (most of the time) your oatmeal is off the charts the very best! – I exercised regularly and fell off the wagon with a knee injury but trying to get back up again. Can you roll up your sleeves and produce a product that would help with Thyroid. I am so thankful for your heartbeat for health and helping us preserve it which provides longevity God Bless you and Muriel and Lincoln! Carole I too am mistaken for 15 years younger than I actually am sometimes more!!! I’ve personally added the marine collagen peptides and not only do my joints in my knees not ache anymore but my skin is looking younger and younger! Another benefit is the little spider veins in my legs are even better!! I contribute my better health all to Andrews vitamins and I speak from my experience only to hopefully b helpful to others!! Best of health to you as Andrew would say! Yes!!! Andrew….a product for thyroid sufferers . And I would like to also add …a product for FIBROMYALGIA sufferers My daughter has had this terrible disability and has suffered for 30 years . THAT WOULD BE G-R-E-A-T… Like everyone else…I’m an Andrew junkie….Your products have had an impact on my health. Thank-you sooo much. Keep ’em coming!!! Hi, I started on his Immune Support Vitamins and my Lupus/Sjogrens went into remission. I would suggest she try those. Everyone’s body is different, but there is no doubt it is attributed to his vitamins. I love your products and hope to be a loyal customer for years to come. I’d like to hear you speak your mind more as well. We’re not intimidated by the haters and anyone who thinks climate change is a hoax created by the Chinese isn’t worthy of your products. Keep up the amazing work! I bought the CoQ10 even though I wanted to cut back on supplements [unemployed + the economy]. The price was attractive (best I’ve seen???) and I will be able to cut back on D3 since it’s included. Now I really need to look into Andrew’s probiotic, as I’ve given up on my regular brand–any opinions? Is anyone else having trouble receiving their items from Andrew’s visit 10 days ago? I received my order from Andrew’s site very quickly. However, my order from HSN is still “in packaging” and may take 10 more days to arrive (they sent an update via email)! To HSN credit they generally are really quick with their shipments. I received notice that my shipment from the Oct show would be delayed also. When I called to inquire as to why no one could tell me why? Possibly Hurricane Matthew had had some effect? Yes, I have received a partial shipment but not all of it. This is unusual. Usually I get my order pretty quick. Yes placed on the 3rd and it’s the 17 an still packing not shipped yet not sure why so long I have order a lot of things of his lately to try I will be making next easy pay befor getting product? I am too, it finally shipped today. Did you order from HSN? I’m not sure if Andrew is aware of the problem. What vitamins do you recommend for someone who has migraines? Catherine , chelated magnesium is used in helping to treat migraines. NOTE – chelated magnesium is the form you want and also NOT a hard tablet but a capsules. You can Google for more info. Thanks for the FREE SHIPPING. Big Help! You Rock!!! Andrew, I wish you could ignore the “negative” comments. You and your company are the “BEST”. When I saw, Free Shipping, I was so pleased to think you are passing your good fortune on to help your customers. Thank You.. When I call ProCaps with questions, I get the nicest, most helpful people to talk to, again, Thank You..
Andrew as always, very gracious addressing the masses with this political mess. Lately I even hate turning on the TV. will be featuring in the today’s special. I do have a request for the chovonuvo. them all! I would also love a mint chocolate version ! Thanks for all you do I have been taking your products for 25 years!! My kitchen cabinets are filled with your products!! Is the choconuvo only for people with cholesterol issues. website and they shipped today!! I certainly hope that HSN takes care of this problem before this weekend’s shows. I ordered on the same day and te finally shipped today! Andrew, my family simply loves all the product we have used. Not even God pleases all the people all the time but anyone who knows about God or has a relationship with Him knows He always does what is in our best interest. I’m very glad you don’t listen to the people who try to find fault with everything and I’m grateful for the free shipping and the way you work so hard to bring quality products to us at the best price possible. If people really want to use your products to help their health then let them budget and give up something else that may not be the best quality so they can afford to purchase at least a small quantity. There will always be complainers no matter how you do things and I am so glad you have prospered to the point you can give us benefits from your growing business. My family only uses your products because we have tried them and they work. Isn’t that the goal of buying any product. You could pay less abs get a lessor result from a product. I prefer to pay more and get the quality you have worked so hard to put in tie products. Thank you Andrew. Andrew I have been taking your supplements for years and have learned so much about supplements when you come to HSN. Your vitamins in my opinion are the best on the market. How someone can get offended with the supposed political comment that you made? Is bewildering to me? You weren’t disrespectful I agreed with what you said it wasn’t offensive. The fact that the S&H is free l’m very appreciative. The negative comments that are made as to the reason very sad. People need to be more THANKFUL!!!!! It” very obvious to me that you try to keep cost that are affordable for your customers. You will never please those that will find anything to complain about so don’t waste your time. Secondly, my son whom is in the US States Army I introduced to your supplements and he has now been taking them for over eight years. He’s doing a tour in Korea at present. He contacted ProCaps by phone and email both to request and ask isn’t there a quicker way that he can get his vitamins shipped to him over there? He’s on auto shop for a couple of them and it” taking 30-45 days for him to receive them. He’s not asking for free S&H he just want to get his supplements sooner. He offered to pay to have them shipped faster and was told by you’re people that wasn’t possible! Both my son and I found that hard to believe? He ordered something from Amazon and got it in less than a week. He’s seriously thinking about discontinuing getting his supplements from you. Your people from ProCaps told my son that they would forward his concern to your attention. Andrew there has to be a faster way that his supplements can be shipped to him. I ask that you please take this into consideration. Have you tried having your son ship the order to you and you can expedite the package to Korea? Andrew’s discussions on how the news impacts our lives is not new information. Mark Sisson wrote a great blog post about this (with research citations) back in 2011. The power of negative news isn’t about political philosophies or cultural wars. We’re human, it’s true, and suffering is an inevitable part of the human condition. Information can help us understand our world and inspire us to work toward constructive change. Our constant access to all that ails, however, comes with genuine mental and physical health costs. Although we might think we don’t participate in media representation of disturbing news, research tells us otherwise. A study of 89 people who were shown footage of four traumatic events showed that nearly 20% reported symptoms related to post-traumatic stress disorder (PTSD) as a result of the viewings. (Frequency of exposure was a factor in participants’ emotional reactions.) As the head of the study explained, “’Acts of violence erode our sense of security and create intense feelings of anger, fear and helplessness. Watching these events and feeling the anguish of those who are directly experiencing them can impact on a certain percentage of individuals causing longer lasting effects.” A meta-analysis of 23 research studies (PDF) focused on terrorism related media revealed a similar correlation with PTSD. Why is your today’s special on resveratrol 100 mg more expensive than the 200Mg resveratrol, which shows $99.00 for 360 caps? which is conveniently on waitlist? Also you stated that your prices on this is lower than when you first offered it. I used to buy this every January as a today’s special, then that disappeared and ever since the prices have skyrocketed. I think I will start keeping track of the prices and ingredients for each purchase. I feel I have spent $1,000’s of dollars on your vitamins since you were on QVC. I am a long time purchaser and I trust your vitamins, but, some ingredients are doubled and tripled if you take many. Andrew, why the recent switch to Chinese-sourced Coq10. In prior broadcasts you ALWAYS said that you got your Coq10 from Kaneka, which you mentioned was the very best Coq10 that you can buy. Also, you indicated that the Chinese Coq10 quality was inferior. If that is the case, it might be worth explaining why you moved off Kaneka and went to Chinese Coq10. Thanks. Got this great deal and couldn’t be happier! You are really a caring and class act, Andrew, to do these wonderful deals for us and provide flex pay, too. No one else does that. Thank you so much. I have been asking for a LUTEIN 10 with the following formula = Lutein 10 mg + Zeaxanthin 2000 mcg (equals 2 mg). The formula you now have is Lutein 10 mg+500 mcg. If I need to take 2 mg of Zeaxanthin then I need to buy your “Maximum Eye Support” which give me more arrhythmia that I have because of the caffeine in the Green Tea. Is seating there on the self and I cannot take it. The formula is perfect I just cannot take caffeine. I have written a lot of times the same request. The customer care answers the emails telling me that they forwarded the request to the correct person but I have been asking for this for more than a year. I stop taking lutein more than 1 year ago and my vision worsened I bought 1 bottle at the local drugstore and in 3 days I noticed the difference just that I may be poisoning myself with what I bought because I do not trust any brand. I am afraid to get heavy metals or foreign substances in my body that does not belong to the formula. I have been taken your vitamins for 10+years and if I could afford I would buy even more because I really need them since I do not take pain killers I just use supplements and do some exercises for pain and energy control. I am looking forward you can surprise us very soon with this request. I guess more people out there cannot take caffeine like me. Andrew, I have been taking almost everyone of your products since you started with HSN years ago and you know they all work for me perfectly! I would never stop taking any of them. Your green tea taste is an explosion of fantastic flavor and it is so healthy for you. I have been to your Lab. here in Nevada. Yes, it is a white-glove Lab. and that is very important! Thank you for all your health knowledge, that is priceless!